Shackleton makes his reappearance in the Listener after a prolonged absence stretching back to 2013, and perhaps unsurprisingly he provided us with a cracker. Straight away there are at least two novel ideas, at least ones new to me, in the choice of grid symmetry and the clue numbering system, in terms of how far the clue starts from the diagonal. Oh, and a carte blanche to boot, four extra words somewhere, and clue enumerations not necessarily trustworthy. So that’s all right then. At least the most obvious starting points, the clues starting furthest from the diagonal, weren’t too inaccessible, and ADMIRER, SOAK, Tosh (or, as it turned out instead, PHOH, but never mind…) and HAS-BEEN fell out soon enough. What was really needed was some crossing entries to confirm positions and get something to go on for the rest. It was a case of working from the SW and NE corners and towards the centre, with helpfully generous clues like the double anagram for SEEMLIER/ SASHAYED proving and entry into the SE corner in due course. It was also a case of reading the damned preamble! For quite a while I was puzzled about the apparent YW pair at the end of the song before I remembered that the various letters had to be read in standard grid order and not clue order. Nothing like making it harder for yourself, eh? But having crossed that hurdle, and as Saturday came and went, I had at least figured out the end of the song line, “TWO BY TWO”, and recalled a childhood song about Noah’s Ark. First major PDM, with about a third of the grid fill to go. Including all the extra-word/ symbolically-entered clues, of course, but I had some inkling that the first half of 6.1 was three–deck ((the creek + D[ec])*), to be entered 3DECK. What the heck has 3 got to do with anything? And, for that matter, I couldn’t make much sense of the presumed extra word “steer”. But was the other half of this clue 2SOME? Nah… at any rate I couldn’t make sense of the word-play, still can’t. Roll on Sunday, and the final charge to the finish line. More of a whimper, perhaps, although at least I was on the look-out for possible 1’s somewhere. And there they were, in MONEY-MAN and TONELESS. 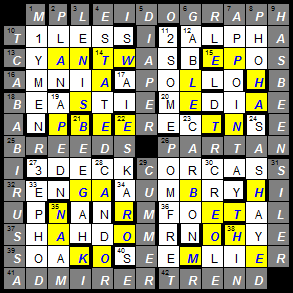 The extra words appeared to be “cross” and something else — “hands”, I reckoned, but I should have seen that you don’t need both “hybrid” and “reviewed” to indicate the anagram, so it was one of those really. Regardless, the grid was filled at last, and the instruction at least was clear enough, with a resulting set of black-out cells fitting perfectly with the pencilled-in numbers all in the top-left. What could it all mean, though? Back to the preamble, again, and the reference to circles (and animals from the song) guided the search for KANGAROO and ELEPHANT; both appearing indeed in circles. Then ANT, WASP and BEE followed in a Z, and all together they formed a ZOO. Which is all very nice, apart from the meaning sixth creature, and ZOO having exactly nothing to do with 1, 2, 3. Apart from ORCA in the fourth block I couldn’t see any animals, not even a hippo. So near, yet so far! More staring, and making sense of the extra words seemed vital. Eventually… Steer = Buffalo = OX, and Hybrid = Cross = Zo, and the 1 2 3 are marking clues in a 2×2 crossword. Well, obviously. With a sigh of relief, I could erase everything else and not have to worry about why it was EPHOD, how the clue for GABLE worked, and so on. How kind of Shackleton to reward solvers who made it to the end of this epic with so little to check at the end, and a new benchmark for 2015’s Gold Cup competition has surely been set in some style. This entry was posted on 17 April 2015 at 4:01 pm	and is filed under Solving Blogs. Tagged: Mixed Doubles, Noah's Ark, Shackleton. You can follow any responses to this entry through the RSS 2.0 feed. You can leave a response, or trackback from your own site.